Welcome back to the second edition of Pandaren Ponderings. Last week I took a look at the Pandaren race. 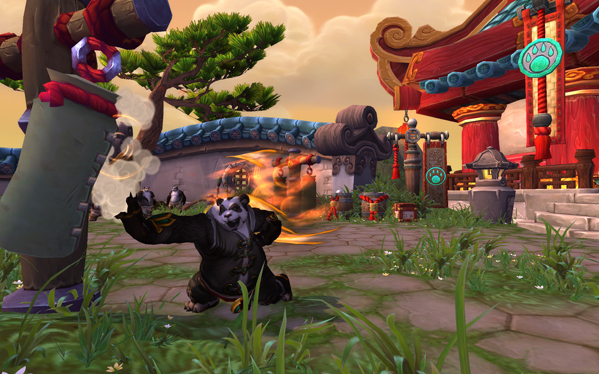 This week I’ll cover the new class introduced in Mists of Pandaria, the Monk. Lets go over the basics, shall we? Monks are available to almost every race in the game. The only restrictions are no Worgen and no Goblins. For those not counting that leaves the 11 remaining races to get their Monk on. Monks are a cloth/leather wearing melee-based class. A true hybrid; they can Tank, Heal or DPS. Lorewise they follow the theme of Asian combat monks, not the stuffy old man in a brown robe stereotype. The reason for this is simple, the class is being “taught” to the other races by the Pandaren. The Monk has three specs which are as follows Brewmaster (Tank), Windwalker (DPS), and Mistweaver (Healing). I’ve always been a tank first and foremost, except for that 2 week stint of role experimentation when I first began playing, but we’re not going to talk about that. (Ed: Ahh, Brad’s college experimentation years.) So as such I’ve spent the most time on beta with a Brewmaster Pandaren Monk. It has been awhile since I played with him so I’m sure a lot has changed, but I still have a fairly accurate idea of how the core class mechanics work.